Normally, it's easy to clean-up stainless steel cookware. That's one attribute it has that makes it so popular with cooks. But, sometimes accidents happen. You put water in a pot on the stove to make some pasta, and the water boiled dry. Now, your stainless steel pot is burned, black and discolored. At least you don't have a burned food mess to clean out of the pot, but the discoloration is still unsightly. You can clean it off with a few household items you probably have on hand. 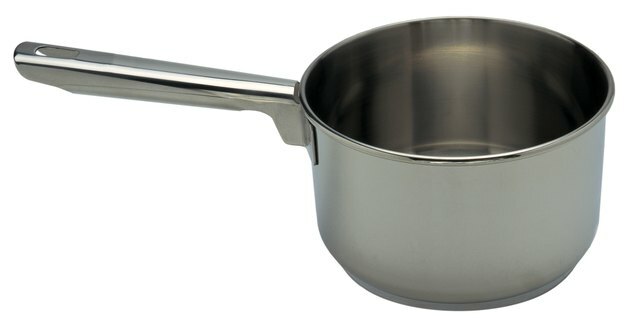 Fill up the stainless steel pot with just enough hot water to cover the burned part. Put three or four squirts of dishwashing detergent into the hot water to clean a stainless steel pot that has burn marks from water on the stove. Pour a half-cup of baking soda into the solution. Then, swish the detergent and the soda around the water to dissolve them. Let the pot sit undisturbed for 15 minutes. Then, pour the water out. Sprinkle additional water across the bottom. Add a dab of water to make a paste. Then, use a nylon scrubber to remove the loosened discoloration from the entire pot. Rinse the burned pot and inspect it. If it still has black marks, sprinkle additional baking soda on the discolorations. Add a dab of water to make a paste. Scrub the pot clean with the nylon scrubber. Wash the pot once more with hot, soapy dish water. Rinse well, and dry.